During the week of 04/30/18, daytime lane closures will be utilized for pavement striping work between 53rd Street and 50th Street. This work will be supported by Bayonne Police. During the week of 04/30/18, nighttime nighttime lane closures will be utilized for pavement striping work. This work will be supported by Bayonne Police. During the week of 04/30/18, nighttime lane closures will be utilized for pavement striping work. This work will be supported by Bayonne Police. During the week of 04/23/18, daytime lane closures will be utilized for pavement striping work between 53rd Street and 50th Street. This work will be supported by Bayonne Police. During the week of 04/23/18, nighttime paving work will be performed on Route 440. Nighttime traffic shifts and temporary detours will be utilized to accomplish the work. This work will be supported by Bayonne Police. During the week of 04/23/18, nighttime asphalt paving work will be performed on the new ramps and roadways to and from Route 440, Pulaski Street and Chosin Few Way. Nighttime traffic shifts and temporary detours will be used to accomplish the work. This work will be supported by Bayonne Police. Motorists can call 511 from any phone (Listen for the initial voice prompt and ask for traffic conditions. Motorists can ask for a specific Highway, City, or even a point of interest. Residents of Newark / Essex County and Kearny / Hudson County can monitor traffic conditions by accessing Turnpike webcams at http://www.njta.com/travel-resources/camera-list, andhttp://www.511nj.org/cameras.aspx. During the evenings of Wednesday, 04/18, Thursday, 04/19, and Friday, 04/20, 8:00PM to 5:00AM, northbound and southbound lane closures on Route 440, between 45th Street and Harbor Drive will be will be utilized for roadway paving work. Traffic entering the Port Marine Terminals from northbound Route 440 will be directed to Harbor Drive. This work will be supported by Bayonne Police. Eastbound Interchange 14-14A: Traffic will be reduced to one lane from 9PM Friday to 5AM Monday. This has been coordinated with the Bayonne Bridge, which will remain open during peak periods Saturday and Sunday. These closings are necessary to address high priority and emergent bridge deck repairs and resurfacing, which are required to maintain the eastbound roadway and shoulder lane during the Pulaski diversion. The eastbound shoulder lane will not be in use during this closure. During the week of 04/16/18, daytime lane closures will be utilized for pavement striping work between 53rd Street and 50th Street. This work will be supported by Bayonne Police. During the week of 04/16/18, nighttime paving work will be performed on Route 440. Nighttime traffic shifts and temporary detours will be utilized to accomplish the work. This work will be supported by Bayonne Police. On Saturday Morning, 04/14/18, the Avenue E Roundabout between 51st Street and 52nd Street will be fully open with all traffic movements available. Continuing the week of 04/09/18, nighttime asphalt paving work will be performed in the Toll Plaza and on Avenue E. Nighttime traffic shifts and temporary detours will be used to accomplish the work. This work will be supported by State and Bayonne Police. Continuing the week of 04/09/18, nighttime asphalt paving work will be performed on Avenue E, between 53rd Street and 50th Street. Local traffic delays are expected. This work will be supported by Bayonne Police. During the evening of Thursday, 04/12/18, 7:00PM to 5:00AM, asphalt paving work will be performed on East 52nd Street and East 53rd Street between Avenue E and Broadway. During this overnight period, street parking will be prohibited and there will be limited access to allow for paving operations. Work will be supported by Bayonne Police. During the evening of Friday, 04/13/18, 8:00PM to 5:00AM, asphalt paving work will be performed on Avenue E between East 49th Street and East 52nd Street. During this overnight period, local traffic to the Toll Plaza will be detoured to northbound Route 440 via 32nd Street, and onto the Turnpike ramp north of Pulaski Street. Work will be supported by Bayonne Police. During the week of 04/09/18, nighttime work will be performed on Route 440 in preparation for paving. Nighttime traffic shifts and temporary detours will be used to accomplish the work. This work will be supported by Bayonne Police. During the evening of 04/09/18, the ramp from northbound Route 440 to the Turnpike will be closed for paving operations. Traffic to the Turnpike will be detoured to Pulaski Street. This work will be supported by Bayonne Police. 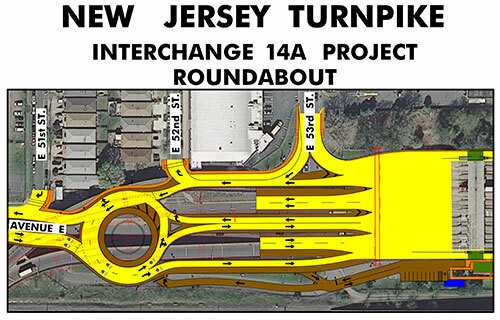 During the week of 04/16/18, nighttime asphalt paving work will be performed on the new ramps and roadways to and from Route 440, Pulaski Street and Port Jersey Boulevard. Nighttime traffic shifts and temporary detours will be used to accomplish the work. This work will be supported by Bayonne Police. During the evening of Wednesday, 04/11/18, 7:00PM to 5:00AM, asphalt pavement resurfacing work will be performed on East 52nd Street and East 53rd Street between Avenue E and Broadway. During this overnight period, street parking will be prohibited to allow for paving operations. Local traffic delays are expected. Work will be supported by Bayonne Police. During the evening of Thursday, 04/12/18, 8:00PM to 5:00AM, asphalt pavement resurfacing work will be performed on Avenue E between East 49th Street and East 53rd Street. During this period, local traffic to the Toll Plaza will be detoured to northbound Route 440, via 32nd Street, and onto the Turnpike north of Pulaski Street. Local traffic delays are expected. Work will be supported by Bayonne Police.